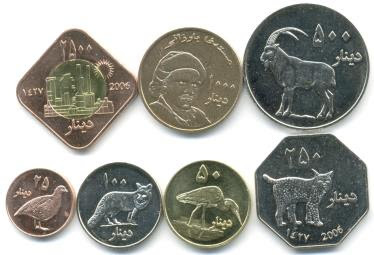 1] Unofficial "coin" sets for recognised territories or countries. 2] "Coin" sets for territories or countries that are partially recognised or unrecognised, but under the control of a single government. 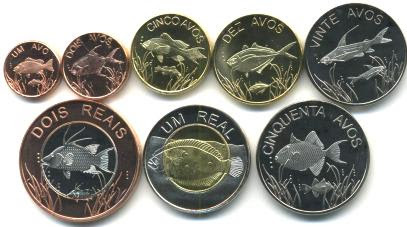 3] "Coin" sets for territories or countries that are partially recognised or unrecognised, but disputed and not under the control of a single government. a] "States" which lay claim to land within a recognised country, e.g. "The Grand Duchy of Avram", located in Australia. b] "States" which do not physically exist, e.g. "The Kingdom of Atlantis". For instance, what if coins bearing the effigy of Edward VIII had been issued for the British Empire? For instance, what if the French Empire in Africa still existed? What would their coins look like? Sets from category 1 are generally issued to appeal to collectors for commercial reasons. Sets from category 2 may be issued for either commercial or political reasons, or a mixture of both. Sets from categories 3 and 4 are generally issued mainly as a political statement. Sets from category 5 are issued mainly for self-advertisement, for fun, and sometimes for commercial reasons. Sets from categories 6 and 7 are issued mainly for fun, and for commercial reasons. This Galapagos fantasy set belongs in category 1], I believe. But which mint is responsible for it? Cabinda, Darfur, Northern Cyprus, and Palestine, all fall somewhere between category 3 and 4. But which mints are responsible for these? Palestine - The Osbourne Coinage Company of Cincinatti, Ohio. I've never been sure if Transdniestra fits into category two - or if these were actually used. 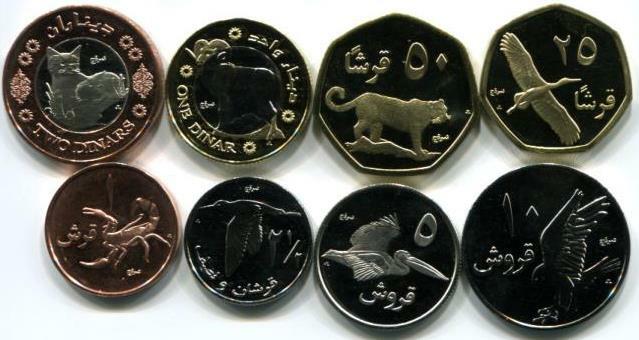 And the mint for Kurdistan, category 4? Notice how both websites I posted lead back to the the American 'Tokens Direct' site. What other pseudo-categories or pseudo-sets can you think of? Dare I mention those from the Malaysian states? These Andorra and Nagorno-Karabakh pseudo-sets belong to category 1]. Would you agree? They come from the Kremnica Mint in Slovakia. Andorra is ... somewhere between 1 and 2. Keep in mind that Andorra is a country with its own government (in the sense of parliament, ministers, etc.) but for historical reasons the two heads of state are the president of the French Republic and the bishop of Urgell. The "Andorran coins" are issued by the "Servei d'Emissions" of the bishop's office. Does that make them government issues? I don't think so, but since they do not circulate anyway, who cares? Some newer pieces that look like circulation coins were made by the Tower Mint (UK) by the way. That applies to various "Andorran coins" issued between 2007 and 2007; don't know about the more recent ones. Give me an example of a country or countries, recognised or unrecognised, with someone actually illegally in control? Originally that was the Spanish Sahara. Eventually Morocco annexed it. The Sahrawi Arab Democratic Republic (SADR) is a partially recognised state that claims sovereignty over the entire territory of Western Sahara, a former Spanish colony. The SADR was proclaimed by the Polisario Front on February 27, 1976 in Bir Lehlu, Western Sahara. The SADR government currently controls about 20-25% of the territory it claims. It calls the territories under its control the Liberated Territories or the Free Zone. Morocco controls and administers the rest of the disputed territory and calls these lands its Southern Provinces. The SADR is recognised by only 81 states. The Arab League does not recognise it; the African Union does. Several states that do not recognise the SADR do however support the right of self-determination of the Sahrawi people. The SADR is not a member of the UN, which has called for negotiations between Morocco and the Polisario Front. The UN does not recognise Moroccan claims, and the Western Sahara remains in the UN List of Non-Self-Governing Territories. 2] Unofficial sets for unrecognised territories or countries. However, I think I need another category for disputed territories or territories where no one government is in control. The SADR would fall under that category. Then I need a category for territories that are only partially recognised. So, Sahrawi would fall under this category also (as would Kosovo, which does not issue coins or fantasy pieces but uses the euro, and is not recognised by several states). I also need to clarify: recognised by whom? The UN; or the vast majority of the world's states? What do you think? How should I best resolve this mess of categories? Complicated, as Somaliland exists within Somalia but has managed to maintain law and order of a sort within its territory. The problem is countries like Taiwan(Republic of China) is only recognised by a small number of countries but it functions as an independent country that the USA claims they will defend if the PROC were to ever invade. The ROC Taiwan had the China seat in the UN until they were booted out back in 1971. The USA and many other countries recognised them as the legitimate government of all China up until 1979 Up until about a decade ago Taiwan claimed all of China as it's domain - but with a change of leadership that is now native Taiwanese and not from mainland China there is a lot of agitation to give up on claiming the mainland, including Tibet and Mongolia as their rightful territory. In some senses you would think the PROC would say bye and let them go. In reality though they claim Taiwan as a "renegade" province. Kosovo is another "country" that claims to be a legitimate government and a lot of Europe and the USA have recognised them as a nation- but still a majority of countries do not - including Spain in Europe, and Russia. Transdnestr functions independently - even has it's own currency. But it is only recognised by other un-recognised states like S. Ossetiya and Abkhaziya that themselves are only recognised by four or five other countries. The most telling thing about Transdnestr is the presence of Russian military there - "peacekeepers" - more like stakeholders for when Russia re-emerges as the major power broker in the region and absorbs large swathes of Ukraine, Transdnestr, Belarus. Transdnestr is a weird place - kind of like a frozen in time Soviet era mini-state with hammers and sickles everywhere. I was antsy about travelling through a small portion of the country because I was there without a visa.